Tsawwasan is a very residential city that is situated on a peninsula towards the southwest of British Columbia in Canada. The meaning of the name Tsawwassen comes from the term “facing the ocean.” This is appropriate as the city is situated in close proximity to the ocean. The historical significance of Tsawwassen is that the surrounding lands are considered to be the home of the first Tsawwassen people. It now lays claim to a very vibrant community of people with several commercial businesses as well. 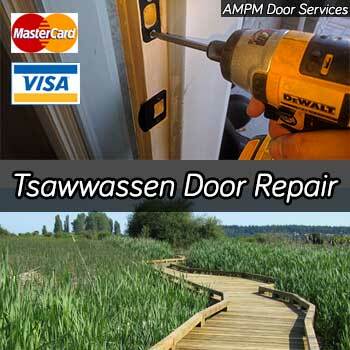 24hr Door Repair provides a fast same day door repair services in Tsawwassen and Delta BC. Due to the fact that the city is close to the ocean, there is a growing concern for the maintenance of furniture. This is due to the fact that rust tends to build up in these areas. Hence the need to undergo repairs with the doors being the most important. We provide 24 hour emergency door replacement and installation services whenever the need arises. One of the most important services we provide is that if your house has been broken in to, we immediately arrive and repair the doors. This is vital in order to make sure that the house is secure and you are free of worry. Our experts will make it seem brand new. The city of Tsawwassen has many residential properties and doors. Hence you need experts in repairing residential doors in order to undertake the repairs. That is where we come in, we will tend to all your needs with regard to residential doors both indoors and outdoors. If the doors are not damaged but the locks are, we could aid you in that regard as well by providing brand new locks or changing and repairing the existing ones. The same is true for the frames in the doors. We are able to fix all door frames at any time you require. Do keep in mind that you need to take special care in repairing door frames as any negligence will further damage it which would increase the costs needed to repair it. We on the other hand, will make sure that such mistakes do not happen. We also provide our repair services in terms of commercial doors. Most commercial properties do not have traditional doors, the doors that they have are either metal or aluminum. There are different methods that are used to repair each of these doors, and we do both without any hassle. Storefront entry doors are the other important area in terms of commercial properties. We undertake repairs on these doors as well as the more advanced aluminum glass doors. One of the more niche areas that we operate in are the repair of sliding patio doors. These doors can be tricky to repair due to the small components in it. We repair the doors as well as any damaged rollers and tracks. These need to be repaired together as they go hand in hand with each other. If the handle locks are what’s giving issue, we can repair that too, even on a sliding pocket door. Do not hesitate to contact us.